Apple may name this year's iPhone upgrade the "iPhone 7," instead of the "iPhone 6s," because the addition of Force Touch input will represent such a significant change to the user interface, according to one well-connected insider. Analyst Ming-Chi Kuo of KGI Securities issued a research note on Thursday, a copy of which was obtained by AppleInsider, in which he reaffirmed that Apple's next-generation iPhone will indeed feature Force Touch input. Currently available on the new 13-inch MacBook Pro, the technology will also be featured in the 12-inch MacBook and Apple Watch. 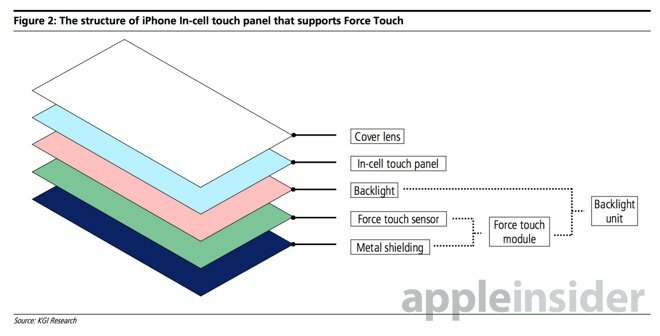 AppleInsider's own sources were first to indicate in February that Apple would introduce Force Touch technology in this year's iPhone upgrade. Since then, additional reports have corroborated this. According to Kuo, Force Touch on the iPhone will represent "the most significant change" to date in the iPhone user interface. In fact, the change will be so substantial that he believes Apple may decide to call the handset the "iPhone 7," rather than an "iPhone 6s." "We believe that iPhone's Force Touch sensor doesn't directly detect the pressure applied by fingers," Kuo said. "Instead, it monitors the contact area on which the finger touches the screen to decide how big the pressure is." He believes Apple will implement Force Touch on the next iPhone by using capacitive technology, and placing the sensor under the in-cell touch panel's backlight. Doing so will save space within the device, and will make it more easily transparent for use on an LCD, he said. Bringing Force Touch to the iPhone will require a number of suppliers, according to Kuo. Specifically, he expects modules will be supplied by TPK and GIS, while metal shielding could come from Minebea, Hi-P, and Jabil. By 2016, Apple may be able to ditch the metal shielding to allow for a thinner form factor. Finally, Kuo said on Thursday that Apple's next-generation iPhone, whether it's dubbed the "7" or otherwise, will again come in screen sizes of 4.7 and 5.5 inches. He said it's unlikely that Apple will introduce a new 4-inch model this year, but did not say whether the current iPhone 5s could be repackaged with a plastic back, as Apple did before with the iPhone 5 to create the iPhone 5c.